We cannot absolutely know that these exact adaptations are the result of pre-concert, but when we see a lot of framed timbers, different portions of which we know have been gotten out at different times and places, and by different workmen -- Stephen, Franklin, Roger, and James, for instance; and when we see these timbers joined together, and see they exactly make the frame of a house or a mill, all the tenons and mortises exactly fitting, and all the lengths and proportions of the different pieces exactly adapted to their respective places, and not a piece too many or too few, -- not omitting even the scaffolding, -- or if a single piece be lacking, we see the place in the frame exactly fitted and prepared to yet bring such piece in -- in such a case we feel it impossible not to believe that Stephen and Franklin, and Roger and James, all understood one another from the beginning and all worked upon a common plan or draft drawn before the first blow was struck. Stephen was Stephen Douglas, Lincoln's opponent in 1858. His part in the conspiracy was the Kansas-Nebraska bill, which he sponsored. Franklin was former president Franklin Pierce who signed the Kansas-Nebraska Act. James was James Buchanan, who supported the pro-slavery side in Kansas. And Roger was Roger Taney, Chief Justice and author of the Dred Scott Decision. 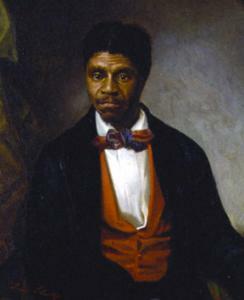 Lincoln's view was that the Dred Scott Decision was an essential part of the plot to "make slavery perpetual and universal in this nation." Buchanan, Taney, and Douglas believed for their part that the decision would put an end to the slavery question. Congress, Taney ruled, lacked the authority to ban slavery in any territory. It followed that the central plank of the new Republican Party, the prohibition of slavery in all the territories, was unconstitutional. This meant, according to Douglas, that his program of popular sovereignty was the only way to deal with an issue that threatened the Union with dissolution and civil war. As is often true, there is an enormous amount of information and primary resources available online. They are not, for the most part, teacher or student friendly. They are designed with the professional researcher in mind. We both add to the largess AND provide structured access to some of these riches. We have put online a twenty-two minute audio treatment of the case, produced by James David Moran for the American Antiquarian Society. We will break it into several components, each running for five minutes or less. Or you will be able to play the entire audio file.